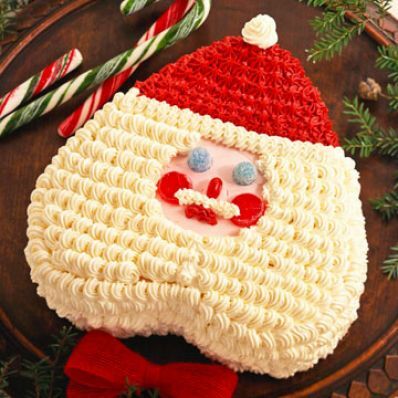 Although this festive holiday cake appeals to all ages, it will be a hit at a kids' Christmas party. Hidden under the clever frosting is a fabulous white cake dotted with maraschino cherry bits. 1 of 4 Heat oven to 350 degrees F. Coat large heart-shaped cake pan (9-1/2 x 8-1/2 x 2-1/2 inch) with cooking spray. Line bottom with parchment or waxed paper; coat paper with spray. 2 of 4 Whisk flour, baking powder and salt in large bowl. 3 of 4 In another large bowl, beat together sugar and shortening on medium-high speed until well combined, about 2 minutes. Beat in egg whites until combined. Add vanilla; beat 1 minute. On low speed, beat in flour mixture alternately with milk in two additions, beginning and ending with flour. Fold in cherries. Pour batter into prepared cake pan. 4 of 4 Bake in 350 degrees F oven 35 to 40 minutes or until cake springs back when lightly touched in center. Let cake cool in pan on wire rack 15 minutes. Turn cake out onto rack and let cool completely. 1 of 1 On low speed, beat butter, shortening, confectioners sugar, extracts and 6 tablespoons cream in bowl until smooth. Add 1 tablespoon cream if needed for good spreading and piping consistency. 1 of 5 Tint 3/4 cup frosting light pink. Place cooled cake on cake plate. Spread pink frosting in thin layer over top of cake. 2 of 5 Apply about 3/4 cup white frosting in thin coat on sides of cake. 3 of 5 Place cake in front of you with pointed end up. About 3-1/2 to 4 inches from top of cake, mark with wooden pick a line for ruffle on brim of Santas hat. With pick, mark off where hair and beard end on face, leaving about 2-1/2-inch round in middle of cake for face. 4 of 5 Tint 3/4 cup frosting Christmas red. Place in small pastry bag fitted with coupler and small star tip. Pipe on hat. Place remaining white frosting in large pastry bag fitted with coupler and shell tip. 5 of 5 Make ruffle for hat by piping white frosting in zigzag pattern across line marked for brim of hat.